An intricate round three-strand sterling silver clasp joins the individual strands of delicate white small potato-shaped freshwater pearls for a graceful effect. Sterling silver double-hole beads are used to further tie the strands together for a more stylish look and to prevent the strands to cross over each other. This necklace measures 18 inches. 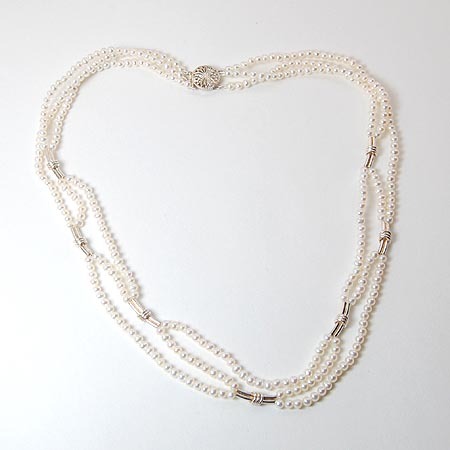 Necklace, white potato-shaped freshwater pearls with silver double-hole beads and round silver 3-strand clasp.